re you frustrated with your lack of consistency and wonder why you can’t repeat your great golf shots consistently? You know what, I totally understand how frustrating it is to know that you’re capable of hitting great golf shots but you have no idea how to repeat them once….let alone consistently. But don’t worry because as you read every word of this article you’ll finally discover what you need to do to groove a consistent swing (without hours of practice) that will have you hitting great shot after great shot just like a well oiled machine. But why has no one taught you this before? It’s very simple: once you find out and master what I’m going to reveal in this article you will no longer need to search for some miracle tip, amazing new swing theory, revolutionary new golf clubs/balls or incredible gadgets. And if you no longer search and buy these things a lot of golf companies will go bust. The bottom line is that your golfing inconsistency is good for business. Which is sad, real sad, I know, but it’s the truth and the truth has to be said. Because golf is one of the most addictive and fun games there is it means there are lots of people and companies out there that don’t give a damn whether you improve or not. All they care about is making a quick buck while this game is at fever pitch. Is it sick or what? The truth that no one wants to talk about or admit is that all the stuff that promises to improve your golf game simply does not teach you how to repeat your great golf shots consistently. And it’s sad how you love to hit great golf shots but you rarely get to experience this thrill consistently because practically all the ways you’ve been taught and shown steer you away from ever being able to do this. Obviously you love the feeling you get when you hit that perfect golf shot…when golf is easy…when you shoot your best ever scores…when your handicap is coming down. Because you would do almost anything to repeat those great performances consistently, since golf is miserably depressing when you’re playing badly, you’re basically forced to use anything that sounds “reasonable” in an attempt to fix your consistency problems for good. But don’t you get so sick and tired of everything claiming to be the…“new, amazing, quick and easy solution to all of your golfing problems” …when all you’d love to be able to do is repeat your greatest ever golf shots – consistently? I mean you’re only human! Anyone would be frustrated not knowing how to repeat their great golf shots consistently…shots that give you that cruel knowledge that you have great ability and potential. Anyone would feel frustration building up inside them when there is never any chance of finding out how to consistently repeat what they’ve proven they can do on occasions. You know, it’s only natural to feel frustrated after hitting bad golf shots when you’ve proven you’re capable of so much more. But who needs to feel like this when you’re playing a game you love? Why should anyone have it so hard…when it can be so easy? No, you WILL NEVER get these answers from anyone else, because the real honest answers that I’m going to reveal to you here are totally unique, yet totally, unbelievably easy at the same time. Now before I explain this system to you, imagine playing a game of golf while hitting every drive as good as your best ever drive. Imagine hitting every putt as good as your best ever putt…imagine hitting every chip as good as your best ever chip…and imagine hitting every pitch as good as your best ever pitch. How low will your scores be when you consistently do that? Picture in your mind’s eye the satisfaction and confidence you’ll feel walking onto the golf course knowing you’ve got a system that lets you consistently repeat what you did before and during your greatest ever golf shots. Imagine playing golf without the feeling of hope, then despair of yet another quick fix not working because you have one method of playing golf that gives you the long term golfing consistency and success you’ve always wanted and dreamed about. Because is there anything worse than walking off the course knowing you could have saved 5, 6, 7 or more shots easily if it wasn’t for dumb mistakes? Don’t you hate missing shots in a game that you can play easily while practicing? And isn’t it so frustrating having to write down a score on practically every hole that should easily be one, two or more shots better?! Plus isn’t it depressing after your games of golf to think how many shots better you should have scored if it wasn’t for your massive inconsistency between your great golf shots and your bad golf shots? “CRACK! Your ball shoots off from your clubface like a bullet from a gun. You finish your swing and watch your ball climb high up into the blue sky and it seems to hang up there for a fraction of a second before falling gently to the ground. And as your ball is falling you notice that it has some draw spin on it….WOW!…what an awesome feeling. That felt so damn gooood!! You look around the driving range to see if anyone saw that last shot. It must’ve gone well past the 250-yard marker…on the fly! You tee up another ball. You want that “awesome” feeling back, and hey, why shouldn’t you, you’ve just proven you can do it? You get yourself ready to hit the ball, and you’re trying so damn hard to remember exactly what you just did to hit such a great golf shot. You can’t remember too much about the physical swing, apart from the great feeling of powerful, yet relaxed ease that you seemed to have during and after the swing. It felt so smooth, rhythmical and easy. And you can’t believe what awesome distance you got from such an easy, effortless swing. From all the stuff you’ve read everyone seems to agree that to have a good repeating swing you need a slow and low take-away along with a steady head. And that must be what you did to hit that last great shot. Yeah, so just try to concentrate on those two things. You start your backswing sloooowly and try really, really hard to keep your head still. But this time instead of your swing being like it’s on auto-pilot it feels stiff and mechanical. And it’s like you’ve been given rubber-shafted clubs and a steel ball – CLUNK! The ball squirts off to the right with an ugly looking banana slice! You silently scream to yourself….it’s just so damn frustrating. Why can’t you repeat that great golf shot? Why do you go from one extreme to the other?…Why? Why? Why?…now calm down. Take some nice, slow deep breathes. This frustration is not going to do your golf game any good, you know that for sure, don’t you? OK, those swing thoughts didn’t help but what can you try now? Just then you remember reading in Tiger’s book that your swing shouldn’t go past parallel. Now maybe that’s what happened on that last shot. You let your swing collapse at the top and your club went beyond parallel. That’s it! You tee up another ball excited about the possibilities of solving your consistency problem once and for all. And if that’s what Tiger thinks about, then it’s gotta help you, right? So you swing making damn sure that your club does Not Go Beyond Parallel and THUD. It wasn’t a great shot but at least it went straighter than last time. You tee up another ball and before you swing you again remind yourself not to swing beyond parallel…THUD. Again, it wasn’t a great shot but it went relatively straight and straight certainly beats the jungle, that’s for sure! You could be onto something here. You tee up another ball, setup to the shot and start your backswing slowly and deliberately and make sure that your swing is nowhere close to parallel and….CRACK! Yes, that felt solid and it flew straight! That’s it, you’ve finally found the secret. But hold on, you’d better hit a few more shots before you start getting too excited. You’ve been let down so many times in the past when you’ve honestly believed you’ve found the answer to your consistency problems. Times when you would’ve put the house on the fact that you’ve got this game licked. So you tee up another ball and remind yourself to just do what you did on that last shot. Concentrating on keeping the club short of parallel you start your swing and focus on your backswing. How far exactly did you go back?… CLUNK…another big banana slice. This is getting embarrassing! You decide to take a short break and think about things because this practice is getting you nowhere…fast! As you’re taking a break you suddenly remember that great golf shot you hit about 10 minutes ago. The one that felt so easy and powerful. You remember the awesome feeling you got from that shot. The rush that went right up your arms as soon as you struck the shot. The sense of power that you got from watching the ball fly high and true with that great looking draw. Man that felt good! You decide you’re going to do that again. You’re determined and you’re not going to be denied. There’s just got to be something out there that can help you to repeat that perfect shot. OK, think, think. If you can just figure out what you did and then repeat it…man, you’d be some great golfer. Maybe it was your grip? Is this anyway to play golf? How many of us live with the false hope that some “quick fix” is going to give us long-term golfing consistency and success? And is it any wonder over 95% of golfers greatly lack consistency trying to improve their golf game using the same old quick fix, try this, hope like hell it helps, golfing information, swing advice and gadgets that guarantees we’ll never consistently repeat our great golf shots! We can talk all you want about how having the right amount of professional and technical knowledge should be enough to be consistent. We can talk all you want about how the current swing theory and the right equipment are all you need. We can talk all you want about all of that stuff, but clearly it’s all meaningless. Obviously the real secret to becoming the consistent golfer you want and dream of being is to simply find out what you did mentally before and during your great golf shots and then consistently repeat that. And that’s why you can play great one minute and crap the next. Because the times you’re playing great you automatically go through a mental process before each and every shot that gives you the most chance of success. And this mental process lets you swing with nothing going through your mind as to what you should or shouldn’t be doing. Or in other words, you just hit the damn ball without any technical crap buzzing around in your head! So when you hit your bad shots, when you lose your consistency, it’s simply because you have not gone through the same mental process you used before you hit your great golf shots. Plus, when you hit your bad shots you most certainly don’t have a blank mind when swinging do you? You’ve got a million and one things racing through your head…keep your left arm straight, watch the ball, make sure you turn your shoulders 90 degrees, whatever you do don’t fat this one, keep your head still, transfer your weight, don’t hit it right because there’s OB over there etc., etc. Now with all these types of thoughts bouncing around in your head are you surprised you lack consistency? And are you surprised you can’t fix your consistency problems for good when almost everyone is trying to give you a physical solution? Practically everything you’ve been taught that promises to fix your consistency problem stresses how you must do all the physical movements correctly, which gives you even more to think about doesn’t it? Anytime you or anyone else hits a great shot, no matter what level of golfer they are, you’ll have one thing in common during the stroke. Your mindset will be exactly the same. Because no one has ever hit consistently good golf shots without their mind being relaxed, focused and totally void of any technical thoughts! And no one has ever hit consistently good golf shots while concentrating on the physical movements when swinging a golf club. Having said that, every golfer that has ever played this great game has analyzed what’s gone wrong mechanically after they’ve hit a bad golf shot BUT the golfers that become successful, consistent and fully enjoy playing golf to the best of their potential realize there is no such thing as a perfect swing. For example, did you have a perfect swing when you hit your great golf shots? Of course you didn’t, the reason you hit your great shots was because you were in a state of mind that let yourself hit the great shot. And is this state of mind going to come from some technical knowledge?…Is this state of mind going to come from trying some “new” swing theory?…Is this state of mind going to ever come from a lesson from some pro?…Is this state of mind ever going to come from some technical/mechanical instructional book or video?…Is this state of mind going to come from some gadget? Because clearly this state of mind is only going to come when you find out and repeat the 7 mental secrets YOU used before and during every great golf shot. And this is the secret to becoming the consistent golfer you dream of becoming. It’s the secret to finding out how to groove a consistent, repeatable swing that hits great shot after great shot without hours or practice. Or in other words, finding out and practicing the 7 mental secrets you used before and during your great golf shots is the quickest and easiest way for you to become a more consistent ball striker without practicing for hour after hour. Plus it’s the simplest way to play closer to the potential that you’ve proven you’re capable of…and no one is teaching you it until now! But I want to make sure you’re not mixing up my message here. I’m not saying that the physical setup and swing fundamentals aren’t important. No, I’m not saying that at all. But what I am saying is that obviously if you don’t find out how to repeat the 7 mental secrets you used before and during every great golf shot you’ve ever hit, then you don’t have a hope in hell of becoming a consistent golfer…no matter how good your setup and swing become. Because if you had a “perfect swing” BUT you often lose your concentration or you choose the wrong club or choose the wrong options or you have a bunch of negative thoughts going through your head as you’re swinging (or a million other mental mistakes) you’ll never play well consistently. Obviously the bottom line here is that the fastest, most dependable way for you to become a consistent golfer is to find out and repeat the 7 mental secrets you used when you’ve hit your greatest ever golf shots. That way, you’ll be more relaxed, have less frustration and enjoy playing golf more than ever! It took me a long time to realize this – 25 years to be precise! 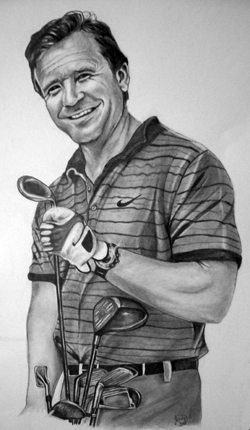 As you know my name is Jeff Richmond and I started playing golf at the age of 10. And as a teenager I became a very good golfer on a scratch handicap with dreams of playing on tour. I couldn’t imagine anything better than travelling the world playing the game I loved and getting paid for it. But to keep on improving I thought I needed to build the perfect golf swing. So I studied the golf swing and tried to change my golf swing to become technically “perfect” but as I started doing that something strange happened. The more I understood about the golf swing and the better technically my golf swing became the more inconsistent and worse I got. But no amount of practice stopped these dumb mistakes. I would work hard on fixing one problem only to have another one appear. I could never seem to put everything together consistently like I did when I played my best ever games. I would be driving great and putting poorly. Or putting well and hitting the ball like crap. I came to realize that trying to fix one problem after another was never going to give me the long term golfing consistency and success I wanted and needed to reach my golfing goals. So I went looking for something that offered a permanent solution to my consistency problems but found nothing. I was concerned to say the least! But I knew I had the potential to play on tour because I’d shot in the 60′s many times before. I kept thinking that if I could just find out what I did to play those great games and hit my great shots and repeat that then I’d be a really good golfer. We all want to recreate our best performances. Why shouldn’t we? We know we’re capable and have proven we can do them. And if we’ve done them once we can do them again…can’t we? Anyway, as the years ticked by I was getting sick of spending hours practicing and slowly getting worse. But I was determined to get better, so I went to many different pro’s trying to find the solution and in the process I got even more confused. I knew that tips, gadgets, DVD’s and equipment didn’t offer the long term consistency solution I was looking for, but the pro’s seemed to give me little pieces of information just to get me started then I would have to go back for more. It was like they were leading me up the garden path. Surely they wouldn’t do that just so you keep coming back for more lessons (and pay out more money)…would they? Also, I found every pro seemed to have a different idea about how to swing the golf club leaving me with no idea. As a result my scores kept getting higher and higher until I ended up averaging just under 80 every round. So I know how it feels to lack consistency and I know what it’s like to try to improve and get worse. In fact, when I was averaging just below 80 I was ready to quit the game I loved because I was just so frustrated with my lack of consistency. Every game I’d hit some great shots, as good as ever, but the bad shots were embarrassing. So I decided I was either going to quit playing golf or search and find the answers to consistently improving my golf game. Of course I didn’t want to quit because I loved playing golf and when you’re playing golf well it’s the best feeling in the world, isn’t it? Remember your best ever game of golf. Visualize it….go over it…wasn’t golf so easy? You weren’t thinking about what you must do, you just did what you should do! Then out of nowhere it hit me like a ton of bricks that I just needed to find out the secrets of what I did mentally to hit my great golf shots and then repeat that. And when I found the secrets I vowed I would share them with as many serious golfers as I could, because I know first hand how frustrating golf can be when you’re not playing up to your potential. Also I know first hand how technical knowledge and practice alone will never, ever teach you to consistently repeat your great golf shots. And I know exactly what it’s like to play great one day, honestly believing you’ve got the game licked and then crap the next leaving you totally helpless as to what you’re going to try next to fix your consistency problems. Plus I knew that the reason I never fulfilled my potential was not physical. Although I didn’t have a perfect swing (no one does) I knew I had the ability to hit great golf shots just like you do. In fact, years ago I analyzed on video my good golf shots and bad golf shots and the technical differences between the two shots was minuscule. Even when you slowed the swing down and analyzed it one frame at a time, side by side you could barely notice any technical difference. So obviously the answer to our consistency problems had to be largely to do with the mental side of the game. And with that obvious realization I set about trying to find everything I could on the mental side of golf. Now to be honest with you I was shocked with what I found. Why do I say that’s junk, it sounds like good advice, right? Well that statement is 100% correct, BUT unfortunately no one gives us any practical advice or techniques on how to actually do this shot after shot. So after finding out that most mental advice golfers are given is terrible, I then broadened my search into psychological tools for life improvement. And by doing this I found a lot better information and tools, which I then tested and adapted into a system for golfers. I discovered the 7 mental things ALL golfers do when they hit great golf shots! And when I discovered these 7 mental secrets and implemented them into my golf game the change was dramatic. I went from averaging just under 80 per round to playing par golf! And the best bit is I did this without hardly any practice and continue to do this to this very day! This was awesome because it blew apart the myth I’d been led to believe that to improve your golf game you need to play and practice often. I kept hearing that if you don’t play or practice often then you’ll continually get worse. Of course, I didn’t want to slowly get worse (who would!) and that’s why I designed this system so I could improve without having to practice or play regularly. And in the process of creating this system I found out that you the need to practice to improve your golf game is one of the biggest golfing fallacies there is. This system allowed me to hit shots very close to my best shots consistently. All this without trying to change my swing, getting worse before getting better or anything like that. After reading these great results you may be wondering why I don’t go on tour now if this system is so good. Well, even though I consistently and easily play par (or better) golf now with very little practice, I don’t have the desire anymore to go travelling around playing professional golf. That was my goal as a teenager but now things have changed a lot. Because I have a family, my golf school, friends and I love the place where I’m at now. Plus, I love what I do. I really get a kick out of helping golfers like you to improve and I love getting positive feedback from people putting into practice what I teach in the golfing systems and plans I created. And speaking of plans, did you notice how most of the golfers above talk about a plan? Well, what they are referring to is a comprehensive step-by-step plan that helped them create and habitualize a simple and quick mental routine (which takes less than 20 seconds) to use before and during every golf shot. Now this simple and quick mental routine includes the 7 mental secrets these golfers used every time they hit a great golf shot, which in turn gives them the most chance of doing it again. Obviously this leads to the golfing consistency they’ve always wanted and dreamed about without the hours and hours of practice they thought and were led to believe they’d have to put in to get it. And here’s how this plan is setup. After the first 30 days of the plan (which only takes an average of 13 minutes and 46 seconds each day) you’ll have the exact same mental routine to use before and during each shot as everyone else that follows this plan. And the reason I designed it this way was to give each golfer the necessary mental skills and knowledge to then personalize their routine to match as closely as possible to what they did mentally when they hit their great golf shots. Which is what you’ll be doing for the rest of the days of the plan. But don’t think for a second that you have to do all the days exercises consecutively because that could not be further from the truth. You can do 2, 3, 4 or however many days of the plan you want, take a break and then pick up again where you left off, no problem. Also you can do ALL the exercises at home…anytime, day or night with very little time commitment. And that time commitment (or lack of it) is a very big thing. Because I know what it’s like to play or practice very little but still have a burning desire to really improve at this great game. And that’s why I designed The Consistent Golf System to fit around golfers busy lives instead of it being their lives. Anyway, I can assure you, when you practice there is no guarantee you are going to get better, a lot of times you will be practicing the wrong things or the wrong way and get worse as a result…what a waste of time! But with this system you are guaranteed to get better without hours of practice. Plus, this system is so easy to follow even a kid could do it, and I wish I did have this system when I was a kid. Who knows how good I could have become and how much money I would have saved on lessons, books, videos and gadgets. Not to mention how much time I wasted practicing things that were never going to help me improve. How to dramatically improve your ball striking consistency without hours of practice. Find out how to consistently and easily get your mind into the same state it was in when you hit your greatest ever golf shots. How to concentrate 100% on each and every golf shot to give yourself the most chance of success. How to hit every shot without any technical thoughts destroying your natural swing. How to trigger your mind to completely concentrate on the shot at hand to the exclusion of everything that has happened in the past or may happen in the future. The mental technique that Jack Nicklaus used to become arguably the best golfer the world has ever seen. How to make all your golf swings as automatic as driving a car, walking or eating. You know you hit your best shots without any negative thoughts telling you what you should and shouldn’t do as you swing. But now you’ll finally find out how to hit every golf shot with a blank mind. How to program your mind to consistently swing with the same powerful ease of the pro’s. How to reduce your worry and anxiety about results. Trying to make a score or trying to force things to happen is one of the worst things you can do if you ever hope to consistently repeat your great golf shots or play great golf consistently. The simple mental technique that helps your anxiety, confidence and motivation all at once. How NOT to become score conscious when you’re heading for your best ever score, i.e. when you’re in with a chance of breaking 100, 90,80 or even 70. The best mental technique that will teach you how to be relaxed and in control all the time on the golf course. How to block penalty inducing elements (e.g. out-of-bounds, bunkers, lakes, trees etc..) out of your mind. The four things you must do before you will ever have a consistent, repeatable and reliable swing. The simple mental technique that will increase your golfing confidence by over 100% – instantly. How to detect and correct your own swing faults without having to pay for expensive lessons. How and what to practice so you don’t waste your time. The secret mental technique Tiger Woods used naturally as a kid to hit shots consistently where he wanted them to go. How to play all your golf shots without any fear. Find out how to mentally prepare so you play your best golf every round. The best technique you will ever find to cure bad faults that you may have done for years, e.g. can’t play bunker shots or always miss short putts etc., etc. How to build a repetitive, powerful, fluid, rhythmical swing without hours of practice. The secret mental technique that ensures you concentrate on the shot at hand without thinking about the past or future. Or in other words: how to really play one shot at a time! How to improve your putting and chipping touch without practicing. How to automatically swing without any conscious thoughts destroying your chances of success. Find out how to use only the necessary amount of muscular tension in your body to hit all your golf shots consistently to the best of your ability. Because over tightening your muscles at the wrong time in your swing is one of the biggest causes of bad shots, i.e. slices, missed putts, duffed chips etc., etc. How to stop a bad shot from destroying your round. How many times do you hit more than two bad shots in a row? It’s easy to stop this from happening when you learn how. How to consistently repeat the free, easy, fluid and powerful movements you produced when you hit your best ever golf shots. This is the real secret to a consistent, repeating swing. Take a simple and quick test that will clearly show you the differences between your great golf shots and your poor ones. Then you’ll find out what simple exercises you can do to easily hit more great shots. Discover what you must do to choose the best club for every shot you face. It’s no good being able to hit great golf shots if you can’t choose the right club, is it? Find out what to ask yourself after your shots to ensure you play your next shot to the best of your ability. How to feel relaxed and at ease over every single shot. Trust me, this feeling is so much better than feeling nervous and afraid about what may happen. Discover the little known technique that will let you go from frustrated to motivated in a split second. This is a critical skill to use after bad shots and by finding out this technique you’ll save yourself a lot of shots you would have normally wasted. How you can enter into a state of relaxed concentration when playing any golf shot. This will let you to have all your focus on what you are doing to the exclusion of everything else happening around you. Imagine how good you’ll play once you learn that. How you can become a confident golfer with a click of the fingers. Also use this amazing mental technique to completely relax yourself in less than a second. After reading just some of the benefits of The Consistent Golf System you can obviously see that this system has so much practical information, techniques and exercises that you’ll never find anywhere else — and clearly that’s why it’s normally so expensive (it’s on sale now for $1628) and everyone who get’s this system has to sign a non-disclosure form. But lately I’ve been feeling very guilty. You see, golfers from all around the world seek me out and ask me for advice on how to improve their golf game. And I help them as much as I can but the real answer that will help them the most is to find out what they did to hit their great golf shots and repeat that. I can’t however teach people in an Email or over the Internet how to do that however. But I do have The Consistent Golf System which at $1628 is the most expensive golf improvement system available on the Internet. But at that price point a lot of golfers can’t afford it even though it’s worth every penny. So what I have decided to do is, for a very limited time I’m going to let you get this system for a much, much cheaper price. Then when I have too many golfers going through this program I will pull down this page at a moments notice. See, when a golfer get’s this system I give my total commitment and support to that person for 6 months to ensure that each golfer is 100% successful with this system. Clearly this personal support and attention takes a huge amount of my time. So when too many golfers are going through this program and support will be compromized then I will take down this amazing offer. Listen to simple exercises on CD #4 that will train and improve your concentration levels so that you can focus 100% on each and every golf shot to the exclusion of everything else! Obviously with this system you’ll finally have the rare opportunity to discover just how much fun golf can be…when you abandon all the useless swing theories, ideas, tips and gadgets that sound good, but don’t teach you how to consistently repeat what you did to hit your greatest ever golf shots. You’ll now be able to play golf with the consistency you’ve only dreamed about. All this without putting in the hours of physical work you may have thought you needed to become a consistent golfer. Also, you’ll finally find out what the top golfers in the world do mentally to play consistent golf week after week, month after month, year after year. And you’ll now have the rare opportunity to discover just how much fun golf can be. Plus you’ll now be able to hit the golf ball with an automatic fluid swing that will never break down, because it’s just so simple. Also with your Consistent Golf System, you’ll never be alone out there anymore. I’m always here with you….anytime you need help, or just want someone to talk to. Because I know what it’s like to come off the course knowing you could’ve played so much better but you don’t know how or what to do about it. And I know what it’s like to have played great some shots and terrible on others. I also know what it’s like to have some fantastic scores on some holes only to need a calculator on others. Plus I know what it’s like to be playing great one second, only for one bad shot to set off a chain reaction of bad shots. And I also know what it’s like to be totally frustrated with all of this and have no one else give a damn. Because of all of this, when you get this unique system today you are only given the best advice and care from me personally to make sure your consistency problem is beaten, not just for today or tomorrow but for good! With this system you also get a 197 page plan, valued at $199. This plan explains in simple step-by-step details exactly what you should be doing and when to create a mental routine that matches as closely as possible to what you did when you hit your great golf shots. In this plan you’ll find simple and easy to understand, step-by-step instructions, along with over 147 pictures, showing you exactly what you should be doing on any given day. Plus you’re given simple daily progress charts so you can tick off each task as you complete it to keep track of where you’re up to. Also, you’re given 5 CD’s that have all the exercises you need to complete the program. So this plan will help you to easily turn the 7 mental secrets in the system into a habit…fast! 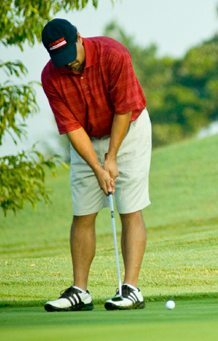 A habit that you will use before and during every golf shot you play until your golfing days are done. And this new habit of yours will give you the most chance you’ve ever had of hitting every shot to the potential you’ve proven you’re capable of when you’ve hit your greatest ever shots. So how long does it take to begin to see results? As soon as you get the system and start to follow the plan you will see an improvement in your very next game. Within a month of following your plan you will be a totally new and improved golfer, and within 3 months the full effects will be kicking in. After that you will not remember what it was like to feel frustrated coming off the course saying “if only”. Of course you must understand, if you do not follow the plan you will not see the results. I know that sounds stupid but it has to be said. And this may sound stupid too, but a definition of insanity is “doing what you’ve always done and expecting different results”. I can promise you that if what you are doing now of have tried in the past has NOT given you the golfing consistency you’ve wanted then it will not do this 1 month from now, 6 months from now, a year or 5 years from now. Because to become the great golfer you hope and dream of becoming you MUST find out and consistently repeat what you did to hit your great golf shots. This 52 page manual gives you 1 entire page to record the critical information from your games relating to The Consistent Golf System. Once you get the system you’ll find out the one and only goal you should set for each golf game to ensure you play to the best of your ability every single game. 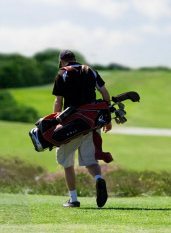 This manual provides you with a unique resource to record only what is really important in every game of golf you play. This game recorder manual gets you to record your game like nothing else does, because no one else will tell you what you should be trying to achieve and keep track of for every game of golf. They all say, “keep track of your greens in regulation, fairways hit, etc., etc.”, but if you want to really improve at this game that information won’t help you. With this Game Recorder Manual you’ll find out the one and only thing you should be “trying” to do when you play golf and how you can measure whether you’re a success or not. It’s easy once you know how. Look, I’m 100% committed to making sure you get the consistency, enjoyment and handicap you deserve with The Consistent Golf System, and that’s why I back this up with 6 months of free email support. If you have any golfing questions, problems or need any assistance in using the system I’m personally here to help you. That is another reason why you can feel safe trying this system, because I give you a complete 6 month service guarantee. I’m so convinced that The Consistent Golf System will work for you that I give you my personal back up and support guarantee when you try this system. You have 6 months to work with me. There is no extra charge for me to help you with any golfing problem. I will give you better, more specific information and help than anyone else ever will. See, unlike everyone else that promises to improve your golf game I will never leave you hanging. Which is another major difference between me and other forms of golf improvement information. I know what it takes to be consistent. I understand the commitment you’re making when you try this system and I honor that commitment by backing you up 100%. When you watch a young baby focus on an object their concentration is unbelievable. You cannot distract them until they have finished their study of the object. But they don’t “try” to concentrate. They don’t force it because that is just not natural and it’s plain uncomfortable. But on the golf course the strain that most golfers have would give a lot of them a headache. Of course we all know we need to concentrate to play well, and that is probably why most people strain to do it. The sad thing is that the harder you try to concentrate the more tense and less focused you will become. But wouldn’t golf be so much easier if before and during every golf shot you are relaxed, yet totally focused at the same time? Imagine playing shot after shot completely focused on what you need to be doing without feeling tense or uncomfortable. Just imagine playing shot after shot without forcing, without any thoughts of what you MUST do to hit the ball CORRECTLY! This Relaxed Concentration Programming CD gives you ONE amazingly simple mental exercise, that with practice will let you go into a relaxed and concentrated state (just what you want for every golf shot) upon saying 5 simple words and giving yourself a special secret physical touch. Just imagine the possibilities of including this amazing mental technique with the other 7 mental secrets of The Consistent Golf System. Didn’t Break 80 But 70! The fundamental psychological keys to achieving the impossible and having a career round this weekend. The 2 biggest mistakes golfers make that cause them to lose strokes after the 14th hole. Find out how to create that feeling of confidence where you can “will” the ball in the cup. How to eliminate all that negative thinking that ties you up in knots with tension, nervousness and stress. The next 13 free bonuses are audios by Craig Sigl to program your mind to improve any aspect of your golf game that you choose. These are proving very popular with my students because…. They are the easiest and simplest way ever to improve any part of your golf game! Makes golf easy and so much more fun! Saves you time because you don’t need to practice! Allows positive suggestions to go into your mind without being discredited, blocked or analyzed! You can put them on your iPod and listen to them wherever you want. So read the list of bonus audios and start thinking about which one’s you’re going to start listening to first. Just imagine what would happen to your game if you could hit every club in your bag at least 10 yards longer. For a start you’d be more confident! You could reach holes that may have been out of reach. You’d have shorter clubs into the greens. What a great feeling that would be! Now, you are guaranteed to hit not only your drives but every shot 10 yards longer all by listening to this audio! Sick of playing army golf….left, right, left, right?! This audio will program your mind with the necessary belief system so that you will automatically and naturally hit your golf shots as straight as an arrow. All this without spending hours doing mind numbing practice! Notice in the name of this audio I didn’t say “build THE perfect swing”. It’s YOUR perfect swing because there is no perfect swing for everyone but you have a perfect swing that hit’s the ball sweetly and right where you want. And this audio will program your mind to help you build a repeatable, perfect golf swing for you. We all know that if we improved our pitching and chipping we would knock a bunch of shots off our scores. This makes sense when you consider about 60-70% of golf is played from 100 yards in. But to practice all the different short pitch and chip shots would take hours each week, and even if you did this you are not guaranteed to improve. Pitching and chipping are not about power, and this means anyone can have a short game as good as a pro. All it takes is confidence and touch. You may be thinking that these two are hard to come by if you don’t do much practice. And most people, would agree with you, but this audio will help you put this myth to rest. Because when you get it you won’t have to practice for hours, you just have to listen to the audio to improve. What could be easier? Bunker shots should be the easiest shots in golf because they are the only shots were you don’t have to hit the ball! We all know this saying but for how many of us is this the reality? I would say the majority of golfers almost fear bunkers. Is it because there’s some strange monsters hiding in the sand waiting to keep your ball in their forever? Of course not that’s stupid, it’s only sand! I believe most golfers fear the sand because even before they have ever been in a bunker, they have heard how difficult they are. Then once they have tried to play out of one, most of the time unsuccessfully, that backs up what they already know, that BUNKERS ARE TO BE AVOIDED! Then you hear of the pro’s who would rather be in a bunker than the rough! What’s the major difference between the pro who finds bunkers easy and the amateur that voids them at all costs? If you can turn your attitude around from a fear of bunkers to rather being in a bunker than the rough, then you will have them licked. The only way to change your attitude in the easiest, no hassle way is to listen to this audio that will make bunkers fun and a score saving place to be, rather than the score wrecker! We all remember the times when the hole looked as big as a bucket. And remember when you hit putts and knew they were going in the hole even before they got to the hole? Imagine feeling like this over every putt you faced. Just think how many shots you waste simply by a lack of confidence on the greens. Don’t you get frustrated after almost every round, knowing how many shots you could have saved simply by being more confident on the greens? Who wouldn’t be frustrated when they know they have the ability to hole putt after putt simply, yet most days the golf ball seems to pick up on your uncertainty and easily slip past the hole with monotonous regularity. Why do you have it so hard when it can be so easy? This audio will make you feel like you did when you putted your best. Remember that feeling? You have done it more than once and now after listening to this audio you will be able to experience this confidence every time you play golf! Most golfers underestimate how much a putt will break and this includes pro’s. That’s a proven fact! But this audio is going to help you to read greens just like you would a book. Imagine how many shots you’re going to save when you do that. Reading greens is an entirely mental thing and this audio will program your mind to read greens quickly and easily. Because your mind knows the best line and speed for your ball to travel on to go in the hole. You just need to get out of your own way to let that happen and that’s what this audio will program you to do! There’s no doubt about it…when you’re confident you play better. And that’s why in this audio you’ll be laying the foundation for building an unshakable confidence out on the golf course. You see, having external confidence is no good. What you need is internal confidence that is not fazed by one or two bad shots because every golfer has them. This audio starts the process of building this confidence foundation. In this second audio session on confidence you get the final pieces of the puzzle needed for you to have unstoppable confidence no matter what. When you finish listening to this audio you’ll ooze confidence out on the golf course that will help you to slash strokes from your game. Do you fall apart when you have to wait for 15 minutes while the group in front of you mucks around? Your rhythm and flow is interrupted and you lose the plot. Or what about when you hit a great drive that ends up in a divot? Or what about when you lose a golf ball that was nowhere near trouble? Hey, look, those things happen to all golfers. But the best golfers, the golfers that enjoy playing golf the most have the mental skills to deal with those situations and not let them negatively affect the rest of the round. That’s what this awesome audio programs you to do. It’s a score saver! Are you afraid on the golf course in certain situations? Like when you’re faced with a delicate pitch over a bunker? Or when you’re on the tee and there’s out of bounds down one side and trouble on the other? Or what about when you’re faced with a tricky 3 footer to win the match? As you know, golf is just a game but when you’re in those situations and feeling fear it’s not quite that easy is it? That’s why this audio training session will be worth it’s wait in gold to you because you’ll actually program your mind NOT to be afraid. Just imagine how much more you’ll not only enjoy playing golf without fear but how many shots you’ll drop off your scores when you can swing freely without fear crippling your natural swing. Is there anything worse that playing well and then all of a sudden your mind wanders and it starts a bad chain reaction of one bad shot after another. All of that happens simply because you lose your concentration and focus. But when you get this audio and listen to it that will be a thing of the past for you. Imagine how it would feel to keep your concentration levels high for every shot so that you focus 100% on what you need to and avoid those blow up holes. Don’t you hate hitting it great on the driving range only to find on the golf course you can’t do a thing right? It’s obviously not a physical thing when this happens. That’s why if this is a problem for you then this audio training session is going to be a top priority for you to listen to. Because it will program your mind to take your golf game that you’ve proven you can do on the driving range to the golf course. Picture in your mind’s eye the shots you’ll slash from your scores when you do that. In this video you’ll find out exactly what the zone is and how to get into the zone much, much more often. You’ll also find out the first step needed to help you do this. In this video you’ll discover one big key to helping you get in the zone more often and how you can practice this anywhere to help you get in the zone on the golf course. You’ll also discover the antidote to fear that will help you to naturally go into a zone state more easily. In this video you get specific exercises to help you feel the zone and then recreate that so you can almost experience playing in the zone at will. Once you have used these exercises you will then be able to find out exactly what works best for you to help you get in the zone. This audio actually programs your mind with the information that was in the zone 3 part videos series so that you train yourself to get into a flow state that will lead to the zone much, much more often. Yes, that’s right, when you get The Consistent Golf System now it’s only $497 USD (plus $57 S & H) for the hard copy version, saving you $1901.00! Or it’s just $197 for the digital version saving you $2201.00. But there’s even more good news….because if you’re tight on cash you can get the digital version in three easy instalments of only $69. Plus remember, all this comes with my own personal help for 6 months . And as you sit there reading this, I know you’re thinking about how great it would be to get The Consistent Golf System now so you too can find out how to hit great shot after great shot just like a well oiled machine. However, I must warn you. If you don’t get this system today you may miss out on this special price and free bonuses! Because as I said, once I have enough people going through this program at any one time then I’ll be taking down this page. And if you come back tomorrow or in a couple of days to get this system you may very well find that you can’t. But I would feel terrible if you responded too late and missed out on this special. So I urge you to click here to secure yourself a system right now before you miss out, because this could be your only opportunity to find out how to consistently repeat your greatest ever golf shots. Plus you risk absolutely nothing. The Consistent Golf System is 100% guaranteed to be the best golf improvement investment you’ve ever made — or your money back. The guarantee is simple — you assume zero risk. Here’s the deal: Go ahead and preview The Consistent Golf System in its entirety (that’s over 8 hours of audio and 395 crammed pages of information and pictures) without risking a single dime. If, for any reason, you’re not completely satisfied within 60 days of ordering – simply return the system and we will be happy to refund every penny of your purchase (less shipping and handling if you get the physical version). Just return the system and ask for a no-hassle refund. No explanation is necessary. You are under absolutely no obligation to keep the system if you’re not 100% satisfied. Plus, you can even keep all the free bonuses worth $770 just as my way of thanking you for giving it a go. But remember, to even try this system you must agree to the terms on this non-disclosure form, because if a person does not agree to the terms on that form I will not send the system out…period! So does all of this make sense? I hope so. But if you’ve got any questions about this system send them through to me (jeff@consistentgolf.com) and I’ll answer them personally. And before I shut up I’d like to ask you to do me a favor and simply remember the last few games of golf you played. Did you hit some great golf shots each and every game you played…some shots that you’d just love to know what you did and how you could repeat them consistently? Obviously you did, because that’s what keeps you coming back for more isn’t it? So if your problem is that you can’t consistently repeat your great golf shots, then I’ll show you the real answers to becoming more consistent than you’ve ever dreamed possible – without having to practice for hours to do it. 2. Making damn sure you never find out how to consistently repeat your great golf shots. Obviously if you don’t find out how to consistently repeat what you’ve proven you’re capable of then you’ll be back to buy more and they’ll make more money from you. But again remember, before you can get this system you must agree to the terms on the non-disclosure form. So click here to go to that form now because you won’t get the system otherwise. Now, if any of this makes even the slightest bit of sense to you, and you are serious about becoming a much more consistent golfer and having a lot more fun on the golf course because of this…then why not explore this a bit further? Just the fact that you’ve read up until here must mean that you not only want to be a golfer…but you want to find out how to consistently repeat your great golf shots you know you’ve proven you can hit. So do yourself a favor and click here to get The Consistent Golf System now while you still can because if you don’t get the system today you many not be able to tomorrow. Plus, by getting it now you save yourself $2201.00 (digital version) and you get all the free bonuses. And just think how much information, products and services you’re getting and most of them FREE! So while you’re thinking about how much more consistently you’ll play once you have this system, you begin to realize that you have only one choice to make, and that is to click here to get The Consistent Golf System now while this is fresh in your mind. If you are still skeptical email me (jeff@consistentgolf.com) to ask any questions you might have and I’ll get back to you as soon as possible. Who knows, you might like what you find out, and if not, all you have spent is a little time checking this out. Since email is free what have you got to lose by emailing me. But again, don’t delay because by tomorrow this could be all full up and you may not be able to get a system. Finally, I look forward to helping you to become more consistent than you’ve ever dreamed possible without practicing. And remember, if you’re tight on cash simply use one of the simple instalment option, but first you must agree to the terms on this non-disclosure form.